GREAT LOOKING CORNERS, EDGES ARE NOT BAD AND LOOK GREAT, AND CENTERING LOOKS NICE. I ALWAYS put all my cards in a perfectly fitting penny sleeve/case, top loader, team bag. 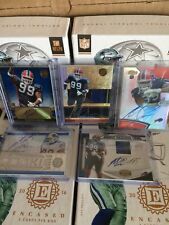 Numbered 15 out of 15 great shape Marcell dareus rookie auto 2011 topps supreme . Very beautiful card in near mint plus condition. Card has great edges, centering looks good, edges are nice and surface is nice. This is a great RC card for any Bill fan. MARCELL DAREUS. Buffalo Bills. (AUTOGRAPHED on the card). Rookie Card. Card is in Mint condition (see scan). IE your item will be identical to the one included the in the scan, but may slightly differ in serial number, relic color, or autograph position. Got a favorite player, team, or college?. MARCELL DAREUS. ROOKIE CARD. GRADED BY GMA Gem Mt 10. 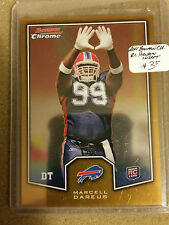 2011 Panini Timeless Treasures "Rookie Signatures" card featuring MARCELL DAREUS of the Buffalo Bills. Cut signature from what appears to be a piece of football leather. Serial #124/265. EX-NM Condition w/light edge chipping the card back (photo #2). COMBINED SHIPPING: $2.95 for the first card or lot. All other cards/ lots won within a 7 day period will be combined and shipped for FREE. Wait for invoice before paying. NOTE: EBAY prohibits combined shipping on orders that qualify for their Global Shipping Program. I'M SLOWLY GRADING CARDS FROM OVER 30 YEARS OF COLLECTING. Free shipping includes a bubble mailer with tracking as always on items over $5.00. Due to an overwhelming request from some to do free shipping on lower end items starting today 11/6/18 all items under $5.00 with free shipping will be sent in a small bubble mailer with stamp and no tracking. If you want to upgrade to tracking just contact us before purchase. I will combine shipping on multiple purchases so all your items arrive together and to save on shipping any combined order over $5 will be shipped in a padded mailer with tracking as well. All Buy it now listings will include free shipping (to the US or a US province). Marcell Dareus. serial number: /139. card number: 124. CARD IS NUMBER 64, AND IS SERIAL NUMBERED 06/25! 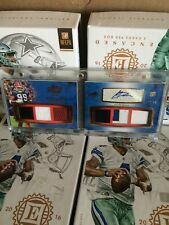 VERY TOUGH "SP" AUTOGRAPHED & MULTI-COLORED ROOKIE PATCH CARD OF THE BILLS GREAT YOUNG STAR, SO DON'T MISS OUT ON THIS ONE!